Happy Halloween! 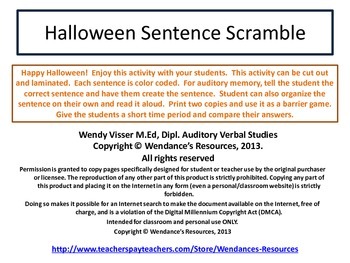 Enjoy this activity with your students. This activity can be cut out and laminated. Each sentence is color coded. 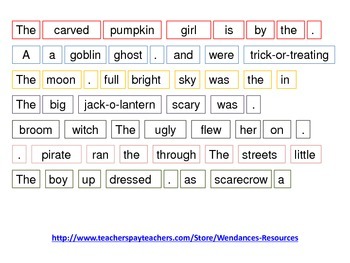 For auditory memory, tell the student the correct sentence and have them create the sentence. Student can also organize the sentence on their own and read it aloud. Print two copies and use it as a barrier game. Give the students a short time period and compare their answers.